I’ve been making this pie for many years. Recently updated it to gluten free because I’ve missed having it the last few years! It’s still great! Every fall we make pumpkin pies from fresh pumpkin. This year I grew sugar pie pumpkins in my garden. We roast the pumpkin – cut in half, take out the seeds and put face down on a baking sheet – bake at 350º until fork tender. Once they cool, scoop out the flesh and puree it to use in pies and other baking. This recipe also works great with canned pumpkin. 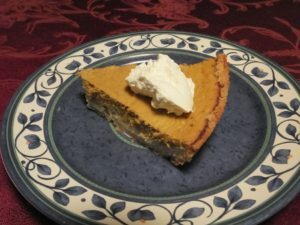 If you have a food processor, you can use it to make the crusts, and then make the pie filling. All I do is wipe out any crumbs after making the crust. Put flour and salt in your food processor and pulse briefly, until mixed. Press into a 9-inch pie plate – fill will pumpkin puree and bake according to the directions below. 1 cup organic cream, raw milk or you could even use coconut milk. Makes Two – 9” pies. Serve plain, or with whipped cream or vanilla ice cream.